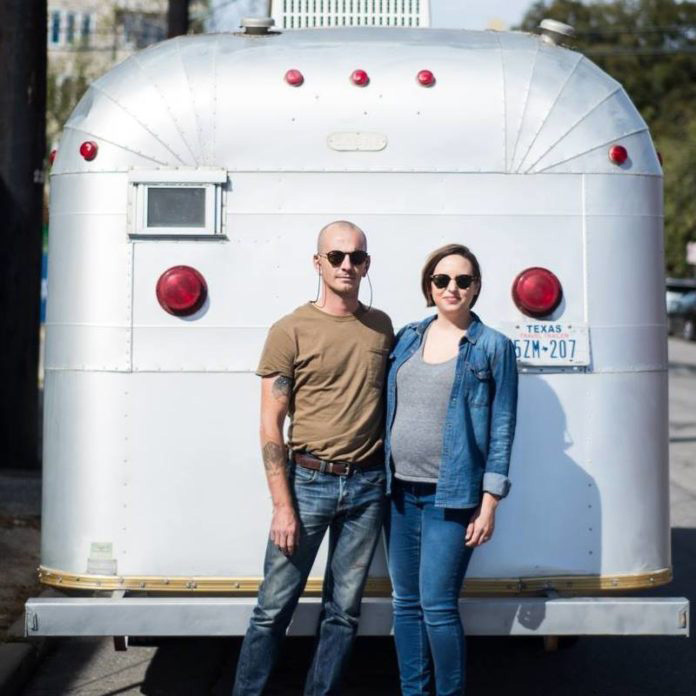 What started with an entrepreneurial streak from a family business led William Dickey to recently open his new hair salon—on wheels. Headquarters, located at 2301 San Pedro Ave. inside the Rose Bush, is ready to showcase a different kind of business in the food truck lot. Headquarters offers haircuts, dry cut, bang trim and shampoo style that caters to customers of all sorts who need a unique experience in and out of the salon. Customer service rolls through a design consultation where Dickey and his wife, Juliette Montoya, gain information to make recommendations for the best cut for a customer’s lifestyle. Next is the shampoo ritual where one is treated with Aveda products and aromatherapy, light massage and a hot towel treatment with men receiving an express facial. It then goes into a customized cut and style where Dickey and Montoya use their combined 19 years of experience to create a cut for all hair types. Once they are done, Dickey and Montoya build a maintenance plan to accommodate their clients’ demands, allowing them to plan ahead to their next service and educate them on home care to maintain that salon look. Dickey’s entrepreneurial spirit started at a young age as he watched his family run their glass business and also worked for them. After finishing high school, he wanted to pursue a degree in education, but his plans quickly changed as he switched to cosmetology school. Montoya is a San Antonio native that started her career at the Aveda Institute. She has worked under Aveda’s global style director Allen Ruiz for nine years. Under Ruiz, Montoya had the opportunity to train with Aveda’s most recognized artists. Aveda products are important tools for the couple not only because they are familiar with them, but also because they incorporate environmental benefits including using organic ingredients. Headquarters is among the numerous portable businesses using a mobile point of sale (mPOS). Since arriving on the market, mPOS is already an important retail tool growing at 9.2 percent per year nationally. Traditional POS sales, conversely, are falling at 2.5 percent per year according to Quickbooks. A report by 451 Research corroborates the trend predicting 54 million mPOS devices to be installed by 2019. With more mobile vendors other than of food trucks, Headquarters is accommodating the needs of their clients by stopping at various locations across the city. The Kauffman Foundation stated that San Antonio has jumped from number 20 to number nine in entrepreneurial growth just two years ago. With much to do to continue branding and expanding, Headquarters is already planning on a philanthropic future. Headquarters is opened Thursday through Friday at 11 a.m. to 9 p.m. and Saturday and Sunday from 9 a.m. to 5 p.m. For more information or to book an appointment, visit www.hdqrtrs.com or call (210) 906-7009.